The military has always been a part of the fabric of our company. In fact, our founder, Ralph Korte, served as an Army switchboard operator in Korea. Money he earned during his service helped start The Korte Company back in 1958. We completed our first military construction project at Scott Air Force Base in Illinois over 30 years ago, and since then, we’ve delivered 500 more DOD construction projects. We think that when you build for the most powerful military in the world it says something about the caliber of your work. We’re honored to serve those who serve us. Throughout our many years and many projects building for the best military in the world, we’ve partnered with the agencies and departments who support the efforts of our troops – including USACE, NAVFAC, MWR and numerous state military departments. With these partners, we’ve built a portfolio that ranges from child-development center construction to chemical/biological-warfare-detection facility construction. 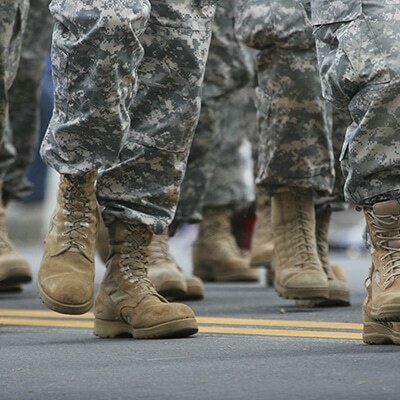 By working with numerous military-related partners and with each and every branch of the United States military, we understand the many nuances and special circumstances of a military construction project. Here are four core benefits of hiring The Korte Company on your next Department of Defense building project. At The Korte Company, we pride ourselves on providing an excellent product at an excellent price. When it comes to DOD construction, well, there’s certainly no exception. We deliver – on time. And when it comes to the Department of Defense, this is a strong weapon to have in our arsenal, as down-time isn’t really an option. Because of our proven Design-Build portfolio, it’s safe to assume that your timeline will be shorter and your process will be smoother when working with The Korte Company. It’s not cheap to protect and serve a nation as big as the United States. So when it comes to construction costs, there’s just not any room in the budget for surprises. At The Korte Company, we pride ourselves on knowing that we’ve never gone over-budget. And that at your ribbon cutting, the only thing you’ll be left holding is a large pair of scissors. Through our many years of building for the United States Armed Forces, we’ve developed a reputation of being a trusted and committed vendor. We’ve received letters of thanks and recommendation from some of the top brass in our nation’s military, vouching for all of the characteristics noted above. Interested in learning more about our take on Department of Defense construction? We’d love to brief you. We’ve delivered more than 500 projects for the military, each one to rigorous standards. In this guide, we reveal how the military achieves maximum value from every project — and how you can too.